Only Nature provides the purest ingredients for this exceptional line of handcrafted botanical products. CLICK HERE TO SHOP IN OUR FIVE STAR RATED STORE!! Only NATURE provides the purest ingredients for these exceptionally-crafted botanical products. "the best face butter in the world!" no water, no fillers, no emulsifiers, no preservatives, or parabens. They are truly-natural and safe for all skin types. micro-lines begin to disappear, leaving your skin "powder soft". Facial Bliss is also wonderful for dry hands. Facial Bliss - concentrated botanical face butter, jasmine scent. 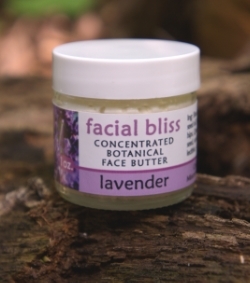 Facial Bliss - concentrated botanical face butter, lavender scent. Facial Bliss - concentrated botanical face butter, juniper scent. Facial Bliss - concentrated botanical face butter, tangerine scent. Great for spot breakouts. Skin care, as practiced by the ancients, the secret to a glowing complexion. Discover the unique sensation of exceptionally clean skin. For thousands of years, people used oil, not soap to clean their faces. stripping, drying, or irritating your skin, or altering your own natural pH. Facial Cleanse - facial cleansing serum for exceptionally clean skin. 2 fl. oz. - $12. Time-tested organic, herbal salves, handmade by traditional methods and passed down through the generations. The herbs used in these products are grown organically on the Falcon Creek Farm, in the heart of the Missouri Ozarks. They are harvested ethically, then crafted into these old-time salves. Even the beeswax, used in these herbal salves, is sourced from another local Ozarks farm. *Not intended to prescribe or cure. Dry Itchy Skin Salve - Historically used to relieve symptoms of dry, itchy skin, eczema, and psoriasis. *Not intended to prescribe or cure. Juniper Salve - Historical uses: skin cancer lesions, chest colds, and breast massage. Juniper infused oil “contains anti-tumor oils, dissolves trouble-some lumps, and repairs abnormal cells.” The University of Missouri-Columbia found compounds in the tree that fight and kill skin cancer cells in mice. *Not intended to prescribe or cure. Poke Root Castor Salve - Historical uses: cysts, tumors, & swollen lymph glands. *Not intended to prescribe or cure. The Family Herbal - "A Home Herbal Starter Pack" - includes 4 of the most commonly used herbal salves around the home: Plantain Salve, Dry Itchy Skin Salve, Juniper Salve, and Monarda Salve. Contains four, 1 oz. tins. natural lip balm in five great flavors! Quite simply, the absolute BEST lip balm we've ever tried! We don't make it, but THIS is the lip balm we would make, if we knew how. We commissioned April to make her wonderful lip balms for Missouri Herbs. She now has FIVE great flavors: Original, Orange, Peppermint, Vanilla, and Coffee! Lip Balm, Original unflavored - all natural. Perfect texture. Lip Balm, orange flavor - all natural. Tastes like a creamcicle. Lip Balm, peppermint - all natural. Mmmm minty. Lip Balm, vanilla - all natural. Smells like a sugar cookie. Lip Balm, coffee - all natural. Smells just like a cup of coffee. April is a talented young herbalist worth watching. we are proud to offer her products. My interest in natural beauty started upon learning about the toxic chemicals I was using in the form of body care products. In addition, our family has very sensitive skin which reacts to almost all the synthetic cosmetic treatments. My Mother brought home a book about making your own beauty preparations. I started experimenting and got hooked! My passion is researching ingredients and learning about both their traditional uses, and more modern scientifically known properties. I love providing myself, my family, and other people with pure and natural products that work, are good for your skin, and good for our environment. It may be a small contribution, but every time someone tries my lip balm and loves it, I am thankful to be able to provide something for them and their family, they can all feel good about using, both inside and out! My other interests include writing (I'm working on a historical fiction novel), hiking, sewing, and learning more about God's creation and how we can use what He has provided for our health and happiness.